Escorts has also announced technology partnerships and relationships with Microsoft, Reliance Jio, Trimble, Samvardhana Motherson Group, WABCO, AVL and BOSCH. Escorts has launched “Autonomous Farming Solutions” with India’s first Automated Concept Tractor at Esclusive 2018. The company also announced technology partnerships and relationships with Microsoft, Reliance Jio, Trimble, Samvardhana Motherson Group, WABCO, AVL and BOSCH for precision and autonomous farming technology integration. 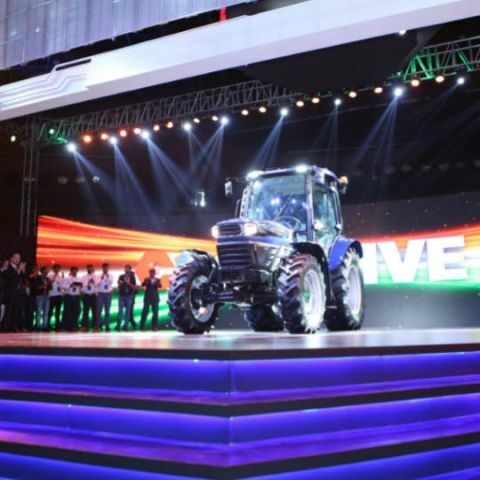 At Esclusive 2018, Escorts’ annual innovation platform, the India’s leading engineering conglomerate, Escorts Limited, announced it’s unique Automated Farming Solutions with the launch of India’s first Automated Concept Tractor that brings the power of next generation digital vehicle technologies aimed at precision-based farming. To be able to deliver this, Escorts has collaborated with seven technology giants namely Microsoft, Reliance Jio, Trimble, Samvardhana Motherson Group, WABCO, BOSCH and AVL. The partnerships and relationships will enable development of a range of farm machines with electric transmissions, autonomous applications, remote vehicle management, data-based soil and crop management, and sensor based guided farm applications. Indian Agriculture & Farming practices requires extensive mechanisation and precision based agro solutions for maximized output and improved farmer income. More and more technological solutions and digital interface are required to enable a farmer to source farming intelligence and better cultivation information on soil health, seeds, water management & advance technologies for much better output and earnings. Inline, Escorts has collaborated with AVL for electric driveline technology , with Trimble for sensors, controls, water level management system and automated e-steering, with Samvardhana Motherson Group for Smart Interface Cabins & Care Plus - a two-way voice interface for real time service, with WABCO for Vehicle Controls & Automation Technology, with Microsoft for its Cloud & AI technology enabling precision agriculture capabilities to help farmers make informed decisions and get more from their farms, BOSCH for future emission readiness and last but not the least, with Reliance Jio for enhancing farm machinery life cycle with networked platform providing top-notch service and genuine spare parts across the country. Escorts also pioneered the platform of Shared Services and Agri Solutions with ‘Escorts Crop Solutions’ to offer end-to-end , state of the art equipment for paddy farming under pay-per-use rental model, TRAXI as a service platform to aggregate farm equipment owners to rent out their equipment to small and marginal farmers, SMART PARTS to offer genuine parts and skilled service at an affordable price, DIGITRAC as a front-end farmer interface for agri inputs and customized agri information & FARM POWER, to provide advanced implements and equipment for efficient and productive farming. Escorts through Esclusive platform also showcased collaborated technology with Tadano for high-end cranes under its newly announced Joint Venture, as well as launched high-end locomotives brake electronic solutions, becoming first Indian company to do so.